Color Assortment Jumper Hacks (6 of each color). 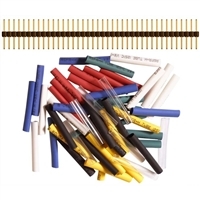 Schmartboard Jumper Hacks Kit contain 42 pieces of 1.0" heat shrink tubes and a row of extra-long headers. They can be used for modifying jumpers you have in hand to the functionality that you need immediately. Examples of what you can use them for: change a female jumper into a male jumper; connect female jumpers together to create longer jumpers; color code jumpers to differentiate signals; splice bare wires together... Let us know your ideas so that we can add them.